kos (Kos, "summit"; the King James Version Coos): An island off the coast of Caria, Asia Minor, one of the Sporades, mountainous in the southern half, with ridges extending to a height of 2,500 ft.; identified with the modern Stanchio. It was famous in antiquity for excellent wine, amphorae, wheat, ointments, silk and other clothing (Coae vestes). The capital was also called Cos. It possessed a famous hospital and medical school, and was the birthplace of Hippocrates (the father of medicine), of Ptolemy Philadelphus, and of the celebrated painter Apelles. The large plane tree in the center of the town (over 2,000 years old) is called "the tree of Hippocrates" to this day. 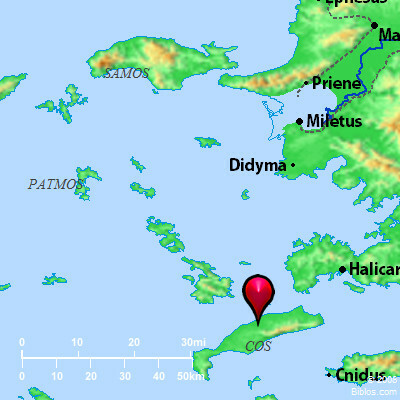 The older capital, Astypalaea, was in the western part of the island, the later (since 366 B.C.) in the eastern part. From almost every point can be seen beautiful landscapes and picturesque views of sea and land and mountain. Cos was one of the six Dorian colonies. It soon became a flourishing place of commerce and industry; later, like Corinth, it was one of the Jewish centers of the Aegean, as well as one of the financial centers of the commercial world in the eastern Mediterranean. Among the benefactors of the people of Cos was Herod the Great. It is mentioned in connection with Paul's third missionary journey in Acts 21:1, and in its relations with the Jews in 1 Maccabees 15:23; Ant, XIV, vii, 2; x, 15; BJ, I, xxi. 11. For a list of works on the island see Paton-Hicks, Inscriptions of Cos, ix. CO'OS (pron. ko'os), an island 21 ms. long from n.e. to s.w. ; it is in the Aegean sea, 53 ms. n.w. of Rhodes, now called Stanchio (pron. stan'keo).